Nothing says fun in the sun, summer, and beach more than flip flops. Here is how you can turn the comfy laid-back foot wear into home decor. Innovative flip flop decoration. 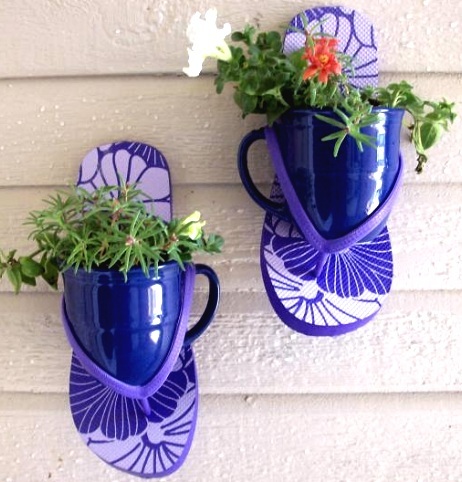 Nail flip flops to a wall, insert coffee mugs or small flower pots. It will take you just minutes to hang and assemble them. Via Garden Share. Perfect flip flop decorations for a covered porch. 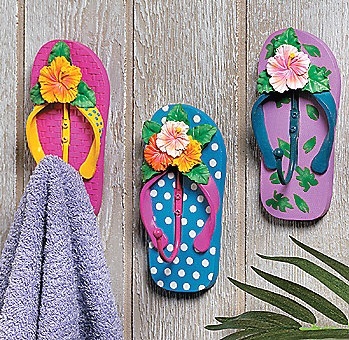 Create Flip Flop Wall Hooks. I see these by a pool or an outside shower. Or in a laundry room. Original source no longer available. 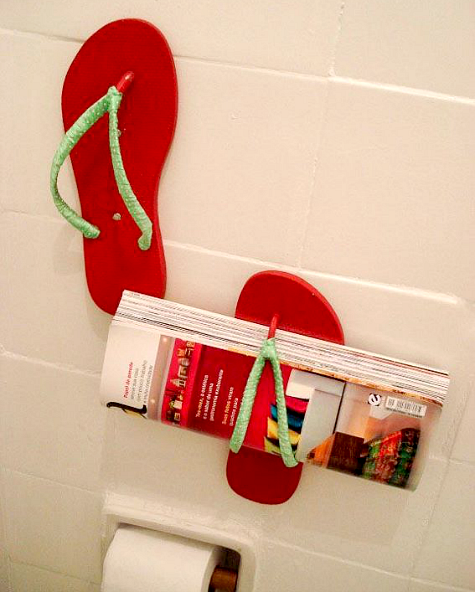 Flip flop magazine holders. Original source unfortunately unknown. 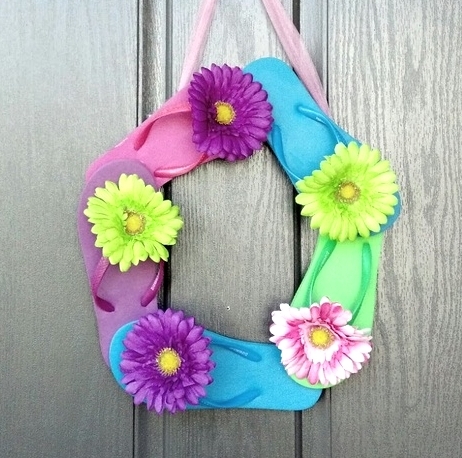 A flip flop wreath as Summer Decor to dress up a door. Via Pinterest. 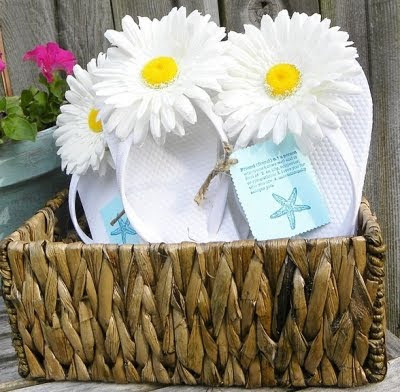 Flip flops are hot glued together in a circle, then decorated with daisies from Michaels. 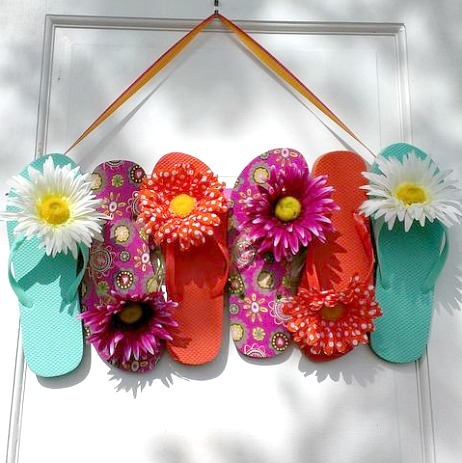 Instead of a flip flop wreath, create a simple flip flop wall hanging! Seen on FB here. Make a flip flop welcome sign. Via Pinterest. Create flip flop art by displaying the shoes in shadow boxes as seen in Coastal Living's Beach House 2011. Make a Beach Party really memorable by handing out some cute flip flop presents. Featured on Beach Party Crafts.